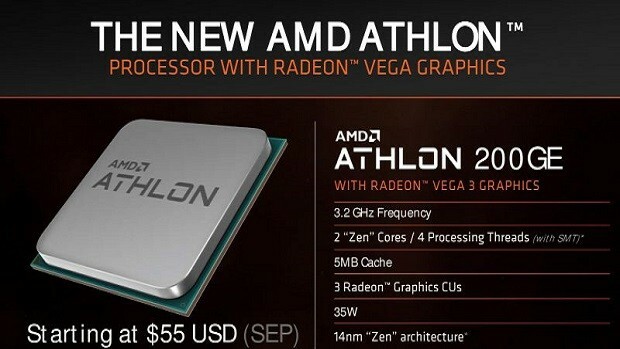 Slides concerning the AMD Athlon 200GE were leaked a while back but now the chips have officially been announced. 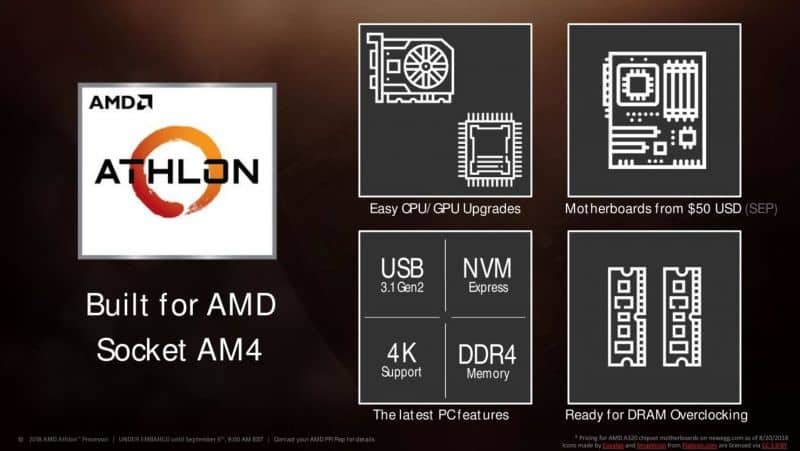 The AMD Athlon name is an old one but the new AMD Athlon 200GE comes with the new AMD Zen architecture and the chips will be supported by the AM4 socket. The new chip comes with 2 cores and 4 threads, which might not seem like much but then again it costs only $55. The AMD Athlon 200GE will be taking on the Intel Pentium series and the pricing is very competitive indeed. AMD is marketing the chip with support for 4K, NVMe and DDR4 memory that can be overclocked. The chips will also support USB 3.1 Gen 2 which will allow for faster read and write speeds as well as data transfers. The chip has 3 CUs and has a base clock of 3.2 GHz. There is no information regarding the boost clock but it is safe to say that it will be around the 4 GHz mark. 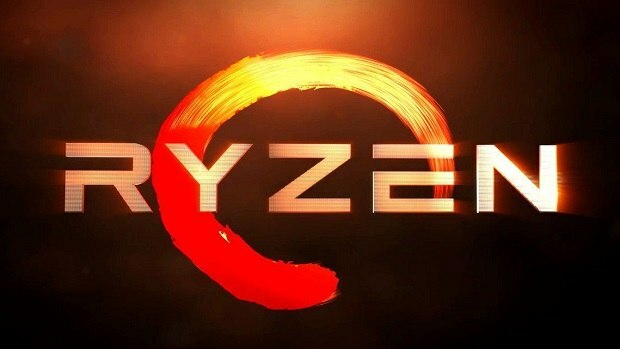 The APU is based on the 14nm process and not the 12nm process that has been used for the current generation of AMD chips. But keeping in mind the price point and the fact that all the chips on the market that Intel has to offer are also based on the 14nm process, I don’t think that it is going to be a big issue. The TDP for the chip is 35W, so it is not going to use a lot of power. 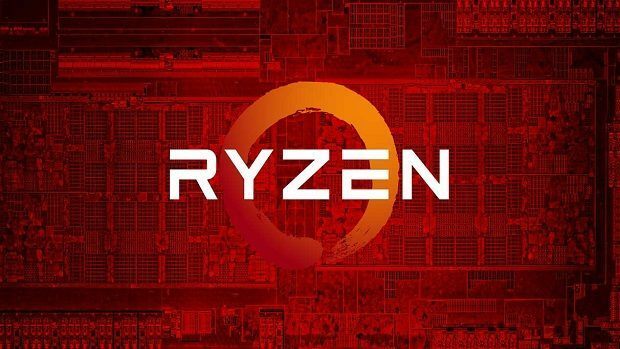 It will be interesting to see whether or not this is going to be as successful with the budget gaming community as compared to the original AMD Athlon CPU. There are 2 other versions as well, the AMD Athlon 220GE and the AMD Athlon 240GE. 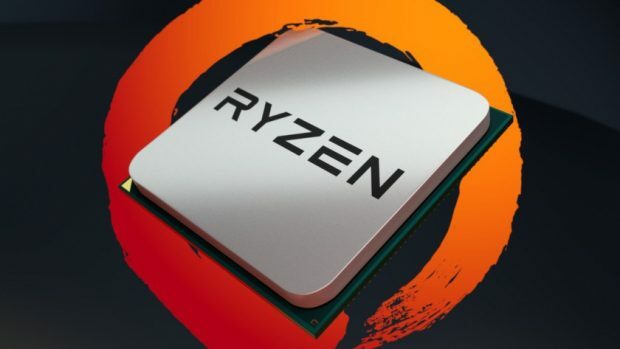 Keeping in mind that these chips are going to use the same AM4 socket that is supposed to be around till 2020, these users are going to have a pretty decent upgrade path if they feel that they need a better CPU. They will not need to change their motherboard in the near future. For more information regarding the upcoming chips stay tuned. Let us know what you think about the AMD Athlon 200GE and whether or not this is something that you are interested in getting for yourself.